Last Year: 4th with a 16-8 (+94) record and 36 points. Melbourne 40 Manly 12 - that's all you need to know (or probably remember) about last season if you are a Manly player or fan. This is a proud bunch who had their pants pulled down in the second biggest game of 2012 and coach Geoff Toovey would not have let any of his players forget that fateful September night... decent motivating factor entering 2013. Impact by committee seems to be the only option for Manly after losing Tony Williams to the Dogs. Justin Horo, Michael Chee Kam and their most recent pickup Tom Symonds are all good enough to be part of the first grade squad, though none are in the game-breaking mold of T-Rex. Two former Titans - Kayne Lawton and Brenton Lawrence might also have a role to play over the course of the season, with Lawton a more than serviceable backup for Matt Ballin. The club made a concerted effort to add depth this off-season with another four or five off-season signings some chance of a first grade appearance in 2013. Michael CHAPMAN, Michael CHEE KAM, Dane CHISHOLM, James CUNNINGHAM, Ben FARRAR, Jacob GAGAN, David GOWER, Kayse GREER, James HASSON, Liam HIGGINS, Peta HIKU, Brenton LAWRENCE, Kayne LAWTON, Justin LEMALU, Ligi SAO, Jason SEAGE, Jesse SENE-LEFAO, Nick SKINNER, Magnus STROMQUIST, Tom SYMONDS, Esi TONGA. Glenn Stewart is out for 6 weeks, so Buhrer and Horo might both start (although Galuvao is a decent starting option for Toovey in the backrow). Watmough should play after a rib injury in the trials, while Williams is no certainty after a knee reconstruction - it looks like Gagan or Farrar will get his spot on the right wing. The bench looks wide open however with King in serious doubt. MAN: B Stewart, Taufua, Lyon, Matai, Farrar, Foran, Cherry-Evans, King/Rose, Ballin, Kite, Watmough, Horo, Buhrer. Bench: Galuvao, Fa'aoso, Lawrence, Rose/Gower/Skinner. Jacob Gagan was signed from the Eels and might be a chance in Round 1 on the wing for the injured David Williams (though the Wolfman isn't confirmed as missing yet), and former Canberra backrower Michael Chee Kam might rue missing the pre-season trials with injury given the backrowers out with injury for Round 1. James Cunningham, Ligi Sao and Peta Hiku are three other names to keep track of during the year. Round 25 is a long time to wait but that's when the Melbourne Storm come to Brookie... before that - Manly fans should turn out in force for the Sunday nighter v Newcastle in Round 2 on March 17 (given it is still daylight savings), but it is a shame that Round 4's Thursday nighter v the Tigers is in Gosford in terms of allowing the fans on the northern beaches to actually make the game. But how much did the preliminary final drubbing at the hands of the Storm drive Manly's off-season? 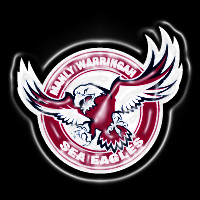 The Sea Eagles have to start the year minus two thirds of their starting backrow (and maybe the whole lot if Watmough isn't fit) - a group that has been integral to how Manly play for years... But starting halves Daly Cherry-Evans and Kieran Foran are fit to open the season and they are as good if not better than every other 6/7 combo in the NRL - they'll keep Manly in the playoff race by themselves if they have to. 7th | Not the slam dunk contender of recent seasons but they've still got the pieces to be dangerous at the pointy end of the year. On their day/night they can beat anyone and it will be intriguing to see if Toovey changes things up a little more in his second season. Their table prediction isn't a reflection of how we rate their premiership chances - they can still win it. 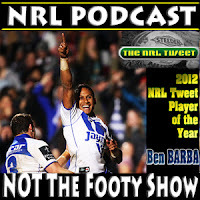 Can Kieran Foran or Daly Cherry-Evans take Ben Barba's mantle as the game's best player in the 2013 @NRLTweet Player of the Year Awards?